Even at 7 am, you could already tell it was going to be another hot day in Siem Reap. The crowded but pretty affair of sunset over Angkor Wat was finally over. We were admiring the bas-relief on the walls inside the massive complex of Angkor Wat. There was barely a breeze and the humidity was choking. The hallways were stuffy with dead air and people were hurrying through them to the open air courtyards found within Angkor Wat itself. We kept forgetting that we weren’t in Thailand anymore. Crazy to think that around this time yesterday we were just leaving Bangkok on the way to Thailand – Cambodia border. Siem Reap, the gateway town to Angkor temples, seems to be built solely to cater to tourists. The dusty streets are lined with hotels, guesthouses, travel agencies, and restaurants offering 50 cent draft beer. 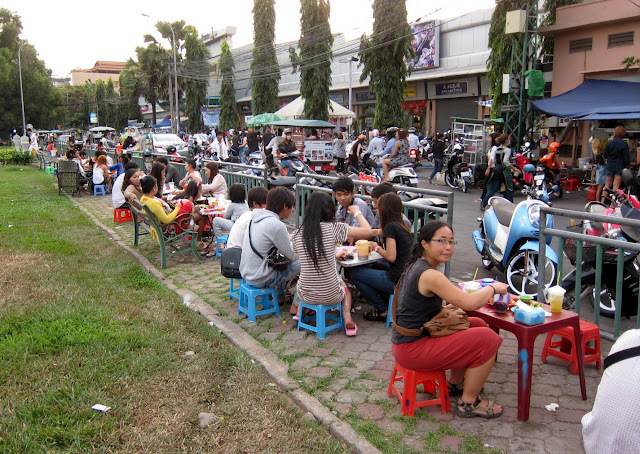 Siem Reap is small enough that tuk-tuks and bikes provide the only means for visitors to get around. 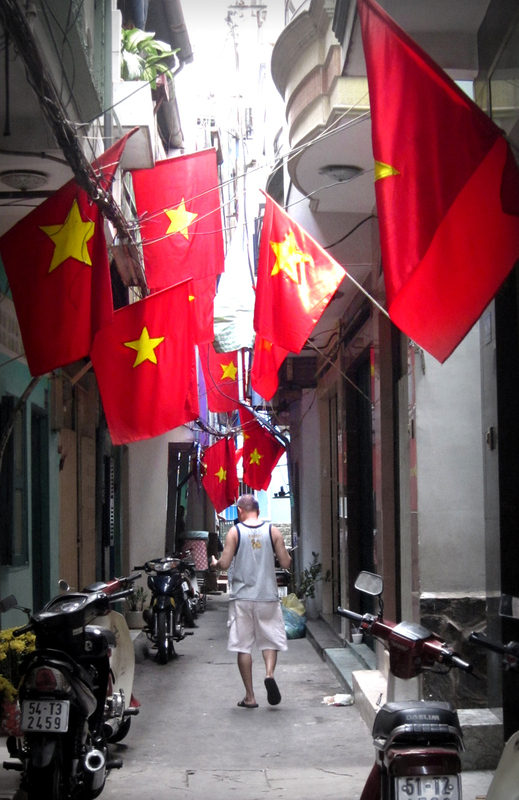 Around 5 pm the streets around the Old Market were swamped with foreigners, red faced from a day out in the temples. They come on bicycles, on foot, filling the streets in huge numbers. I’ve never seen so many foreigners in such a small area before often it seems that we easily outnumber the locals. But for such a touristy town, most of the Cambodians we met were friendly and helpful even if they barely speak any English. They patiently tried to understand what we try to say (in mimes or drawings) and laughed good-humoredly at our attempt at bargaining (or in some cases, our attempt at drawing). I asked our tuk-tuk driver how he manages to be so friendly having to deal with tourists constantly for a living. ‘Yes!’ – he nodded his head vigorously with a big grin on his face. It’s an unsolved mystery. Angkor Wat might be the biggest, but Bayon gets the award for the freakiest. Bayon temple, just down the street from Angkor Wat, is famous for its many eerie and massive stone faces carved onto the many towers that jut upwards from the temple. If we were there on our own, I think it would’ve been a little freaky being followed by these faces where ever you walk. But we were far from being the only the ones there that day. Bayon was simply overrun with visitors. Each step meant getting in the way of somebody else. Everyone was sweating because of the heat and every touch left a sweaty palm print behind. We admitted defeat after Bayon and retreated to our hotel to wait out the worst of the day’s heat. This turned out to be the best decision we’d made. On the way back to the hotel, we passed the other temples on the circuit and each one’s parking lot was jammed packed with tour buses and tuk-tuks. In the late afternoon, we set out to see Ta Phrohm – or the ‘Tomb Raider’ temple as the little kids selling postcard like to remind us. Ta Phrohm quickly became our favorite. Late in the afternoon when most of the crowdes were gone and the weather was more bearable, Ta Phrohm was just simply the most atmospheric of all the three we saw. Ta Phrohm has all of these giant trees whose roots are slowly but surely overtaking the crumbling ruins. Trees live here. There’s moss on the rock walls and jungle around the complex. I can see why they filmed ‘Tomb Raider’ here. The place just feels eerie and old. Whatever the means, avoiding the crowd at Angkor temples is worth the effort (either by coming in late in the afternoon, or doing the circuit the opposite way). It is definitely the way to fully enjoy these amazing structures. Angkor temples are beautiful but we’re glad we only got a one day pass to the Park. At the end of the a sight seeing day, we were pretty templed out even though we barely scratched the surface of what Siem Reap has to offer. The thing to do after a hot day of temple sight seeing? Join the throng of travelers on the streets around the Old Market to hunt for 50 cent beer and fruit shakes! A delicious way to end the day. Wonderful. I think my favourite thing in Cambodia, other than Angkor, was the Icy Juice. It was almost, dare I say it, better than a slurpee. Found your site while looking for places to see in the Canadian Rockies. I'll be back! That looks totally awesome. Ali has told me a lot about it too. So this is definitely on our list, her to go back and me to go first. I love the idea of 50cent beers and a bustly tourist town for good people watching as well. I am a bit worried about the heat though. Was just there in January and Bayon and Ta Prohm are my favorite! I love the faces at Bayon, I didn't think they were creepy at all (me and one of them are my facebook pic right now haha). And Ta Prohm I agree is definitely the most atmospheric. It was quite hot when I was there too, 30-33C every day, but I loved it, coming from miserably cold Korea. I prefer hot over cold any day! Eesh, now I'm kind of worried for when we go! 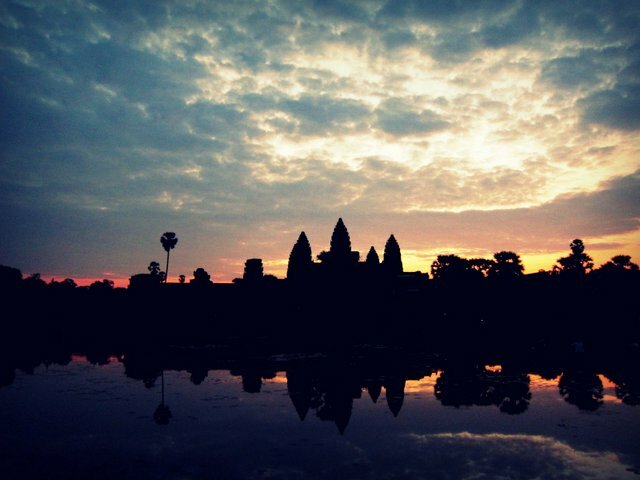 I think we'll be at Angkor Wat early March, which means it will be even more hot than it is now. =/ And it looks like there are sooo many people there….